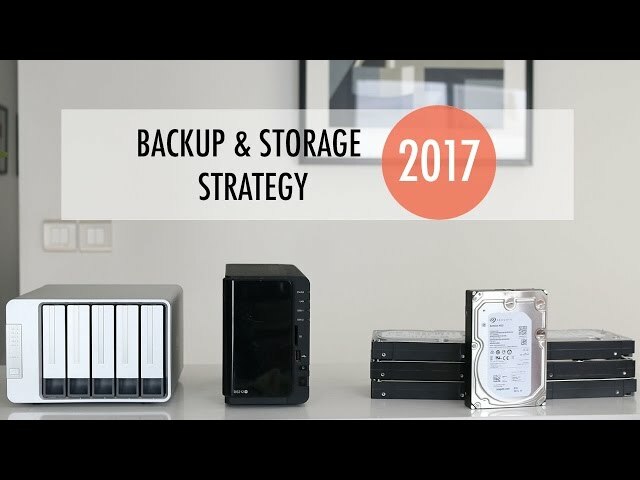 A new year, a new backup strategy: for me 2017 is the year where I’ll be working more than ever with photo and video files, so I’m going to need more space than ever to store them. Besides storing them, I’m also going to need a whole new backup strategy for these new types of files. I’m used to having several gigabytes that need to be backed up, but now I’m looking at terabytes of data that need to be protected against loss. As you can imagine, losing any of these would be a disaster for me and my business, so I’m taking my backup strategy to a new level with several solutions, both hardware and software. Currently I’m storing all my files on two 4TB hard drives, which may seem like a lot until you start cutting video and start taking high-resolution pictures. They’re filling up like crazy now and I need to replace them as soon as possible. On top of that, I’m moving more and more toward 4K, so future-proofing is needed. Below you’ll find my exact strategy, and there’s also a video where I explain some of my choices in depth. The HDD replacement I’ve chose are seven 8TB Seagate Archive hard drives, for a total of 56TB of storage. Now, since I’ll have a RAID and a NAS set up as part of my backup strategy I’m not going to use all of that, in fact I will even lose some of it because of the RAID, but it should keep me going for the foreseeable future. The reason I went for the Seagate Archive is because that manufacturer offers a great cost to benefit ratio; they’re good drives and I was able to get them for around $300 each. They can vary rather wildly in price, though, so make sure you keep an eye on the Amazon page as at time of writing they’re about $225 (ouch!). Now, since I don’t have a computer case that will fit seven HDDs, I’ll be using the TerraMaster D5-300, which is, in essence, just a rack where I can hang five of my new hard drives. The reason I went for the TerraMaster is that it offers great data transfer speeds, partly thanks to its USB 3.0 connector, which I’m going to need when editing video. With storage out of the way, let’s take a look at what kind of backup solution I want to have. I mentioned the RAID before, but before I get to that I want to talk about the Synology NAS I’ll be using. NAS are great for two reasons: on the one hand, since they’re connected to the Internet, you can use one instead of a backup provider and cut out at least one monthly bill. On the other, they serve as a great backup for your backup, so you can rest easy knowing that all the redundancies you’ve set up will keep your data safe whatever may come. To set up this redundancy, I’ll be plugging the two remaining hard drives into the NAS, which will in turn connect to the five Seagate HDDs which will be using Synology Hybrid RAID. This means, in short, that if one drive fails, the other four will be able to pick up the slack. For more details on how RAID works, we recommend this post about Synology DiskStation. So, to recap: my computer will be connected to the TerraMaster with five hard drives and RAID 5 installed, giving me one, limited backup. This, together with every other device I own, is then connected to my NAS, which has two HDDs plus its built-in storage, which serves as another limited security layer. This should give me all the storage I need, though I am a little worried about data transfer speeds, unless I switch to RAID 0, which in turn would give me no buffer. These are some hard choices to make, but I’m confident I have chosen the right strategy with RAID 5 as it’s going to prove to be very handy to work with. It will allow me to shift from my workstation to my laptop, all without needing to worry about where I’m going to leave all the files I’m creating. At the same time, I’ve built up a decent first line of defense against data loss. I am, however, also going to set up a second line through some cloud services that will protect this network should anything fry the whole system at once. Since RAID and NAS are technically not full backup solutions I recommend that you always rely on some form of cloud service to make sure that your data in it entirety remains safe. A single power surge could, and I shudder at the thought, wipe out that entire sweet setup I described and not only would I be out of a lot of money, my business may never recover from the loss of data. In the setup above, I can directly backup the TerraMaster with most cloud services, but few of them will let me backup the NAS (except for CrashPlan, depending on the situation). However, at full capacity the TerraMaster will be holding 32TB (one HDD is reserved for RAID) so some providers are out before the race even starts. For my situation, I feel that Backblaze is my best option because it offers unlimited backup, allowing me to dump the whole mess onto their servers in one go. I also like Backblaze’s price, ease of use and security, so I can take care of all my backup needs in one go. Not that Backblaze needs to be the best fit for you: with some looking around you’ll be able to find the best backup solution for your needs, as well. With that out of the way, all I still need to take care of is that all these different devices and add-ons talk to each other, so I can switch devices yet still work away on the same file like I never moved. Sync.com is my regular service for this kind of thing and I see no reason to change since I feel it offers a great price, lightning-fast syncs as well as zero-knowledge security which means that no one will be able to get to my data unless I allow them to. In tandem with Sync.com I’ll also be using pCloud, mainly because it has a great mobile app which I need if I’m traveling and I can’t use my laptop. These two services will let me keep my brand new hard drives from filling up too quickly since I can just put anything that isn’t a massive video file with them, while also giving me instant access from anywhere and at any time. Between all my new hardware as well as these three cloud backup and storage providers I should be able to not only store all the new files I’ll be creating, but they will be safe from interference and I should be able to access them whenever and wherever I want. If you have any questions let me know in the comments below, thank you for reading. Question! Who is the provider you are referencing in the 3rd to last paragraph? You indicate ” _____ is my regular service for this kind of thing…”, however the name of the provider is missing? Thank you so much for your research, articles and videos! You have been a tremendous resource to me over the past couple years! a mobile device has to have the app installed – which DBox does at no charge and seamlessly. Nevertheless, it is not ideal. Great post. I think a lot of people are in a similar position, especially with media files.